It's that time again. Yes, you know what time. The annual dread of summer ending for those of us in the Northern hemisphere. All of us enjoying the last bits of heat and sunshine until Fall does its magic and brings Starbucks' seasonal drinks, cold temperatures, and 21282109 different shades of dark vampy lipsticks (raise your hand if you own/have owned MAC Sin, Diva, or Rebel--time to bring those babies out!). But the great thing about September is it allows us to hold onto the last little bits of summer, which means that, that tan ain't going away too quickly! It's a whole month to slowly transition into Fall, giving ample time to switch up accommodating your wardrobe, skincare routine, makeup choices, you name it. Transition doesn't imply a total change, you can still hold onto that radiant and healthy summer look, especially by using quality products to help keep your skin glowing beyond the season. Also important is to nurture and treat skin that's possibly been damaged by the sun or needing some real TLC. September is the ultimate 'pamper month,' if you think about it? I know for myself, I've been thinking about what products might be in my arsenal for the upcoming F/W seasons, and what exactly I hope to treat for my skin for this next month and so on. I was recently nicely offered to try out another box from MINTD Box, who have amazingly thought of our transitional needs and concerns for us, and have amply prepared a great assortment of supportive products! If you have not yet read my full intro about them, check out my first post here. To sum up that post, MINTD Box is a UK luxury monthly/bi-monthly subscription box service that offers only the highest quality luxury brands at value price with 4-5 full sized products in every box. The concept is that you are getting more than what you are putting into it money-wise, while also trying out products from a variety of luxury brands from trusted retailers and ones currently globally on trend. I have been so sick of subscription boxes being such a disappointment and including products that I never even use. MINTD Box presents itself in a very sophisticated and organic way that does not feel at all untrustworthy or fake, and I am truly without a doubt so impressed and highly recommend them. The September box has just even more so confirmed these feelings! MINTD Box for September is themed 'Post Summer Skin Rehab,'* which aims to help you keep your skin's radiance, as well as fully nourishing, replenishing, and hydrating the skin throughout the month. 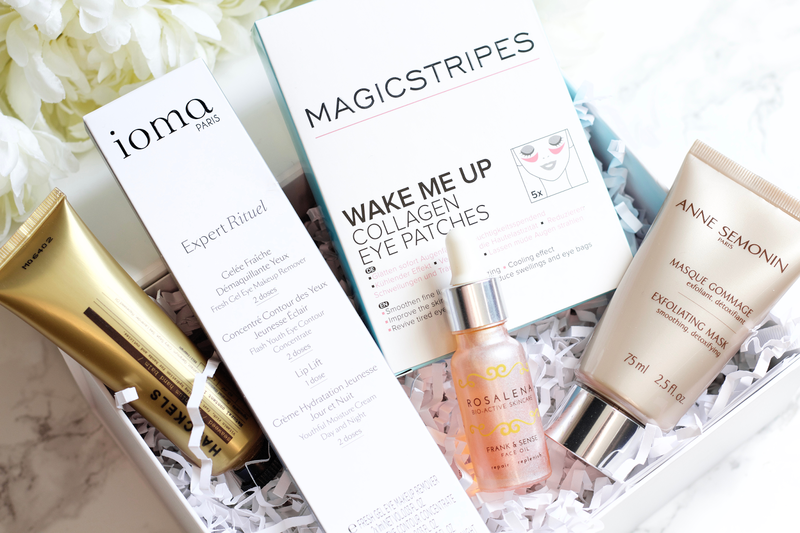 They've included 4 full sized and 1 travel sized product (with 7 separate pieces) as an epic facial experience by using high-quality, luxurious products that have been specially curated by MINTD Box beauty experts. These are from some of their favorite high end brands that are stocked in Harrods, Harvey Nichols, Selfridges, Beauty Expert, and Rosalena. They ship to UK, W. Europe (see full list of countries here), N. America, Australia, and New Zealand. The value of this month's box comes to being over a combined £139/€164/$185, yet you end up only spending £65/€77/$86. You are saving £74/€87/$99 altogether. It is, of course, still a lot of money to spend on a subscription box. I like to break it down in this kind of fashion: pretty much one of those FULL SIZED items (that you actually like) costs about the same amount of money for a one month's subscription. Due to the fact that MINTD Box beauty experts find the best quality and on-trend beauty products from a variety of brands, you're bound to at least find one luxury item that you'll truly fall in love with. Let's compare with spending month after month on a subscription box that you may only like less than half of the items, even though you are paying a low amount per month. In my opinion, it's really not worth it at all to keep subbing if you're not even fully satisfied and my numerous cancelled boxes can show for that. Even if you did end up not liking an item in one of MINTD's boxes (we are all so different, of course! ), you honestly are not even losing out on much since you really only paid for one FULL SIZED item's worth (pay attention to it being a full size, not sample size). It's a win/win situation with MINTD box and it's one of the many reasons why I so highly recommend them. 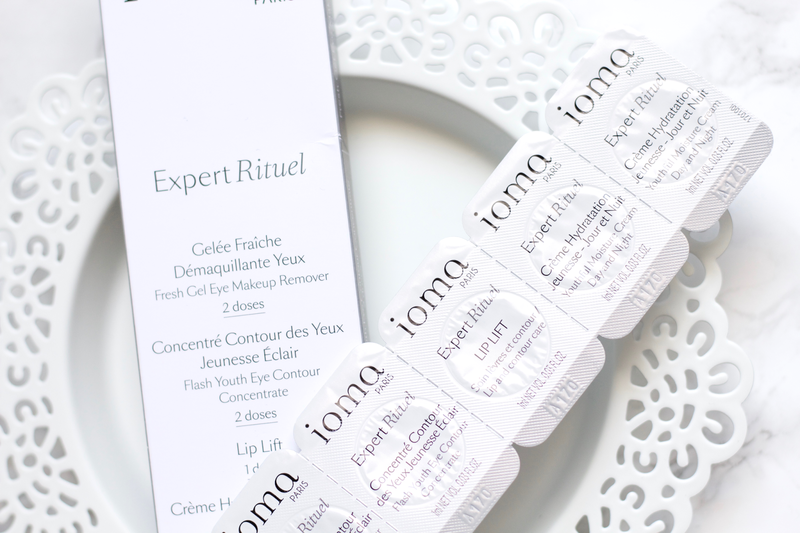 IOMA Paris is a French skincare brand that is relies on the following key words as their building blocks: personalization, high-tech diagnosis, synergy of active ingredients, proven results, and made in France. All of these combine to create the basis of IOMA and their high-quality, professional identity in the cosmetic industry. They claim to have only one goal, that being "proven efficiency for every woman and every skin," and honors that their treatments are paraben free, silicone free, and mineral oil free. They offer treatments with "proven efficiency" in 17 countries that actively sell products from the brand in boutiques/counters, and per their website they claim "every minute a French woman chooses IOMA for her beauty" (any French women reading this and using IOMA right now?). They market their brand as being a specialty experience, with their products made for you personally to tailor your needs. The Ma Creme is a great example of that, where it is specifically made for your skin type and concerns (with over 40,257 formulations, you're bound to have one that fits you). Their dedication to research and proven high-quality ingredients make IOMA Paris a brand that is very scientific-based. 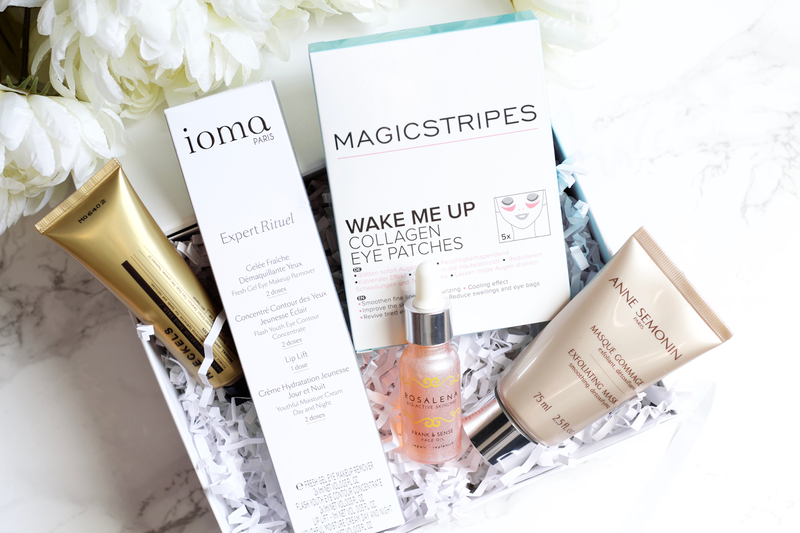 After using these capsules I've been looking over their website and been really impressed at the products, especially since you can get a customized skincare selection through their IOMA Skin Atlas. I'm very much a fan of these travel sized products that give you a multiple samples to try, as I'm never really satisfied with just trying ONE thing from a brand most of the time. Especially if I don't have the best experience from the product, I might have a better one with another, so for me personally I like to dabble a bit and always give more of a chance if I'm able to. The Expert Ritual Tabs is a great 7 piece product that has some vital skin nourishing treatments, very much something to buy if you're traveling or maybe even just going away for a night and want to pack light. They also have other varieties of Tabs available for purchase: Weekend Ritual (treatment for anti-aging that includes a cleansing milk, exfoliating emulsion, day cream, and SPF 50+ PA++++), Optimum Moisture Cream (7 treatments of their Day and Night Moisture Cream for light and refreshing hydration, restoring radiance and strengthening skin's natural defenses), Youthful Moisture Cream - Day and Night (an anti-aging treatment for restoring youthful radiance, using high quality ingredients to repair and support skin; one specifically helps to repair the dermal-epidermal junction, the space between the dermis and epidermis that binds them together, which is a vital area of tissue that works as a communication of cellular exchange between them), and White Revelation Ritual (a brightening and nourishing skin treatment for those on the go, including a brightening cleansing mousse, brightening day emulsion, brightening night cream, and SPF 50+ PA++++). I'm highly impressed with their Japanese PA (UVA protection) sunscreen system usage (PA++++ especially! ), I'm quite interested in trying theirs out! Fresh Gel Eye Make Up Remover (x2): This is a no-fuss, refreshing cleanser that "works to strengthen and support the eyes" and "increase volume, length and strength of lashes" with its extensive formula; including natural exfoliating properties to help get rid of impurities in the skin and deeply cleanse to its best ability. I'm pretty picky when it comes to eye makeup removers, as my eyes are quite sensitive and I don't really trust a lot of brands to not burn/harm my eye/or eye area (I spent too many years using MUFE eye makeup remover, just ouch). I love using Banilla Co Clean It Zero Cleansing Balm for face makeup and especially my eye makeup, it's so easy to use and takes it all off really quickly (I've gotten other people hooked on it too now after using it for so long!). It's become my HG cleansing balm for taking off heavy makeup and waterproof mascara, I don't dare use anything else. I've been using this instead of my Clean It Zero and I've really enjoyed the difference in consistency (CIZ is a goopy, gel to oil cleanser), as the makeup remover is a very light oil consistency and moves around easily to break down the makeup. It has a somewhat medium-strong medicinal scent but that goes away after first applying it. It's a lovely makeup remover and I really enjoy how effective it is at getting rid of every spot of eye makeup. I'm not sure if I saw anything in regards to my lashes, but maybe with longer usage I might. Flash Youth Eye Contour Concentrate (x2): This is an award winning product that I wish I could have more of, I think it's possibly my favorite of all of them. This treatment is designed to "lift the eye area" and "provide structure" to reduce wrinkles. It tones and supports the sensitive and fragile periocular area, which has the thinnest amount of skin of the whole face. It has the nicest floral-perfume fragrance and it is thin in consistency, something I very much appreciate for the eye area and in general for my face. You only need the tiniest bit amount as it easily can be smoothed out on a large amount of surface area and it didn't take long for it to absorb into the skin. If I'm really honest, this part of my routine is not my favorite thing to do but I get a lot of satisfaction after it's done. I'm not sure what it is about doing this part of my routine that I don't really favor, but using this product has made it sooooo enjoyable. The fragrance, thin consistency, and overall quality of the product and proven results I've seen from it have made me so impressed and happy with it. I use a few different kinds of eye products, but this has been the most luxurious and lush one I've used to date. Since I don't have an issue with wrinkles (yet), my main treatments with using it was seeing how it did the times I did not use my DDG Ferulic + Retinol Eye Cream (pretty much the most epic eye lift product but tends to dry out my eye area, although does make it very soft). I found that with such limited use of the product, it did a great job at making my under eye specifically feel smooth, moisturized, and helped any puffiness I had from stress/lack of sleep/etc. I'm sure with longer and consistent usage it could provide even greater treatments and full results, but I'm quite satisfied with using it! Ingredients: Water, Coconut Alkanes, Glycerin, Caprylic/Caprictriglyceride, Coco Caprate/Caprylate, Cetearyl Alcohol, Caffeine, Cyclodextrin, Avena Sativa (Oat) Kernel Extract, Albizia, Julibrissin Bark Extract, Black Currant Seed Oil/Olive Oil/Aminopropanediol Esters, Bisabolol, Menthyl Lactate, Sodium Hyaluronate, Hydroxyethylacrylate/Sodium Acryloyldimethyltaurate Copolymer, Helianthus Annus (Sunflower) Seed Oil, Sucrose Palmitate, Darutoside, Chrysin, Palmitoyl Oligopeptide, Palmitoyl Tetrapeptide-7, Tocopheryl Acetate, Glycerl Linoleate, Linum Usitatissimum (Linseed) Seed Extract, Glyceryl Caprylate, Disodium Acetyl Glucosamine Phosphate, N-Hydroxysuccinimide, Tamarindus Indica Seed Gum, Squalane, Carbomer, Tocopheryl, *Fragrance (Parfum), Ceteareth-20, Phospholipids, Glycolipids, Xanthan Gum, Steareth-20, Magnesium Hydroxide, Polysorbate 60, Sorbitan Isostearate, Phenoxyethanol, Propanediol, Chlorphensien, Pentylene Glycol, Disodium Edta, Sodium Benzoate, Sodium Levulinate, Sodium Anisate, p-Anisic Acid, Potassium Sorbate, Citric Acid, Sodium Hydroxide, Chlorhexidine Digluconate, Sodium Citrate, Biotin. Lip Lift (x1): This product claims that it specifically plumps, hydrates, firms, and and moisturizes lips for a "fuller, raised, and plump" look. This was actually my least favorite product to use. I didn't hate it, but I didn't love it either. The first time I applied it, it was very thin and I only needed a little amount to use for my top and bottom lips. I was really happy about that since there is a good amount included in the capsule, so I knew I could at least use it to really see if I liked it or not. My first impression was that I wanted to take it off immediately, as it felt kind of uncomfortable as it was settling on my lips (not a burning hot sensation, but just uncomfortable). Of course, it does have the usual sensations that come with lip plumpers, but it did not give the best feeling sitting on my lips. It might be because mine are naturally very dry all the time (regardless of how much lip balm I use, believe me)? I didn't feel like it hydrated much besides making it feel softer (I think the Cupuacu butter worked its magic for that). Seeing as my lips are already naturally a bit plump and full, it would be hard for me to gauge that aspect of it. If anything, it might have helped lessen any dry patches on the outer portion of my lips but did not help with middle-inner ones. I'm not sure what positive things I can say about this product, but I was really hoping this would work for me as it seemed like a good one to use. What's really interesting is the ingredients used in this, as Volulip is their main substance to directly be making the lips plump. Its formulation is by using a plant extract (Portulaca Pilosa) combined with a matrikine-mimetic peptide (Palmitoyl Tripeptide-38) to stimulate hylaruonic acid synthesis, which is naturally found in the skin and used as a filler in lip injections. Volulip can be found all over, so I'm sure you've either heard of it or after reading this will start to recognize the name popping up (or even better would be to recognize the ingredients). Ingredients: Water, Caprylyl caprylate/caprate, Glycerin, Cetearyl Alcohol, Pentylene Glycol, Glyceryl Stearate, Theobroma, Grandiflorum Seed Butter, Imperata Cylindrica Root Extract, Cetearyl Ethylhexanoate, Pseudoalteromonas Ferment Extract, Ceteareth-20, Cetyl Palmitate, Cocoglycerides, Chlorphenesin, Carbomer, Tocopheryl Acetate, Sorbitan Isostearate, Disodium Acetyl Glucosamine Phosphate, Xanthan Gum, Sodium Hyaluronate, Capryl glycol, Magnesium Hydroxide, Porticula Pilosa Extract, Sodium Citrate, Sodium Salicylate, Tocopherol, Sucrose Cocoate, Citric Acid, Salicylic Acid, Acrylates/C10-30 Alkyl Acrylate Crosspolymer, Alcohol, Palmitoyl Tripeptide-38, Biotin. Youthful Moisture Cream Day and Night (x2): Not to be confused with their 'Optimum Cream' of the same name, this 'Youthful' variation seeks to restore skin's youthful radiance by helping it to be kept moisturized, protected from daily harsh stressors, and improving skin elasticity that's so easily lost in the aging process. 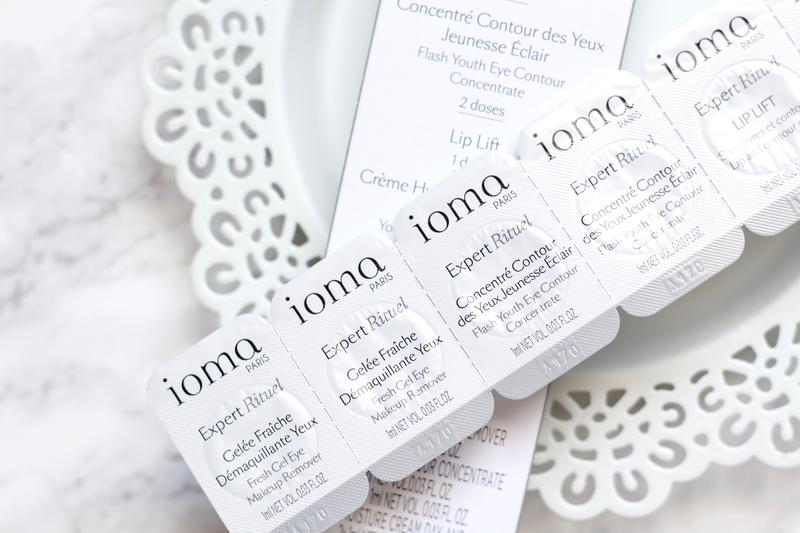 IOMA's products seem to all have this very thin consistency, which I really appreciate since I am not a big fan of thicker ones (except in some of my nighttime routines), and this is no exception to being very light, airy and having such a lovely scent. I can't even really pinpoint what it smells like, I want to say it's some kind of fruity smell, added fragrance, and mixed with a hint of something else? Listed near the bottom of the ingredient list (and I mean waaaaaay down there) is Rosemary Leaf Extract and Sunflower Seed Oil, so not sure if they could possibly be added to that but thought I would just point that out. I love how it made my skin feel very soft but I found that it was not that easy to spread out over my face, especially after my serum step in my routine. I have to spray a mist beforehand so that it doesn't start to pill. It sets as a somewhat velvety/semi-matte hybrid texture on my oily skin (yes, try to imagine that), and wore well under my SPF so no problems there. Since there was only a small amount included, I can't really judge too much, but I'd love to get a bigger size and see how I do with it to really appreciate and analyze how well it works for me! Ingredients: Water, Caprylic/Capric Triglyceride, Gossyplum Herbaceum Seed Oil, Glycerin, Hydroxyethyl Urea (*NOT animal sourced), Butylene Glycol, Ascorbyl Tetraisopalmitate, Dioscorea Villosa (Wild Yam) Root Extract, Hexyldecanol, Behenyl Alcohol, Arachidyl Alcohol, Caprylyl Glycol, Glyceryl Stearate, Hydroxyethyl Acrylate, Sodium Acryloyldimethyl Taurate Copolymer, Squalane (*Unsure if shark sourced or plant derived, will need verification), Palmitoyl Oligopeptide, Palmitoyl Tetrapeptide-7, Arachidyl Glucoside, Tocopheryl Acetate, Fragrance (Parfum), p-Anisic Acid, Ammonium Lactate, Polysorbate 60, Sodium Styrene/Acrylates Copolymer, Carbomer, Glycine Soja (Soybeans) Sterols, Polysorbate 20, Sorbitan Isostearate, Xanthan Gum, Tocopheryl, Helianthus Annuus (Sunflower) Seed Oil, Rosmarinus Officinalis (Rosemary) Leaf Extract, Disodium Edta, Potassium Sorbate, Potassium Hydroxide. *I want to point out that IOMA Paris says that they do not do any testing on animals, but doesn't explain anything about that statement. From looking up interviews and the sort, there is not much regarding information about being cruelty-free or about not using any animal ingredients in their products. *Squalane is a substance taken from the livers of sharks and also derived from plants (ex. olive oil, etc). *Hydroxyethyl Urea, not to be confused with Urea/Carbamide (an organic non-toxic compound converted by the liver into the kidneys through the bloodstream, which is then excreted in urine), is a synthetic humectant created via a combo of ammonia and carbon dioxide. Its moisture retention abilities are comparable to that of Glycerin, based on research case studies. Inspired by her trip to Tokyo after experiencing the magic of under eye packs that are abundant in Japanese skincare, international makeup artist Natalie Franz created Magicstripes to establish a space in the European market for the everyday woman wanting a refreshing, radiance restoring product. 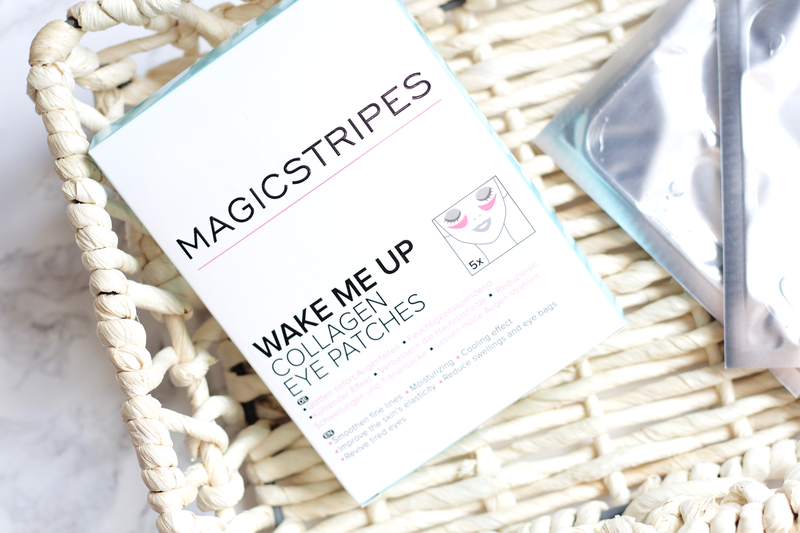 Magicstripes is curated as a fuss-free way to bring back a youthfulness that's been lost through daily life stresses and the unstoppable aging process. Franz is so inspired by Japanese skincare and culture, she even lists multiple ingredients on the packaging in their Japanese name in romaji (Roman lettering). Magicstripes is cruelty-free and formulated without parabens. 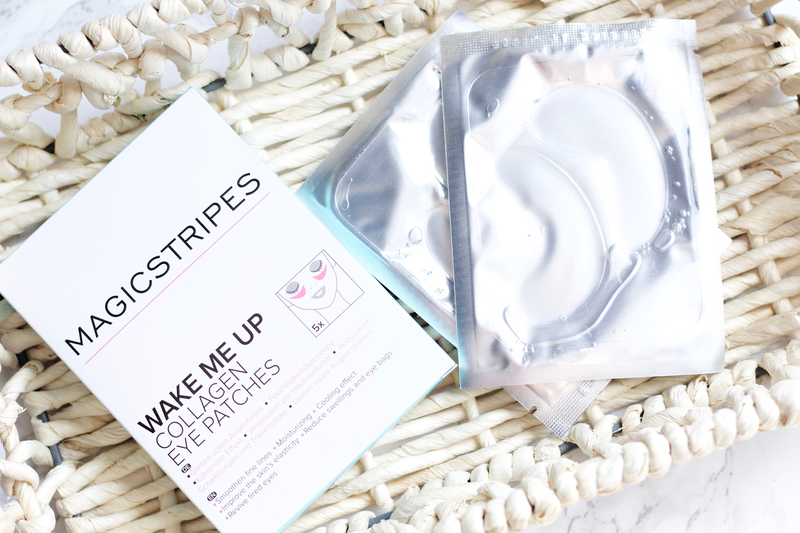 Wake Me Up Collagen Eye Patches are five pairs of cooling eye patches that help reduce the appearance of wrinkles, dark circles, and eye bags. 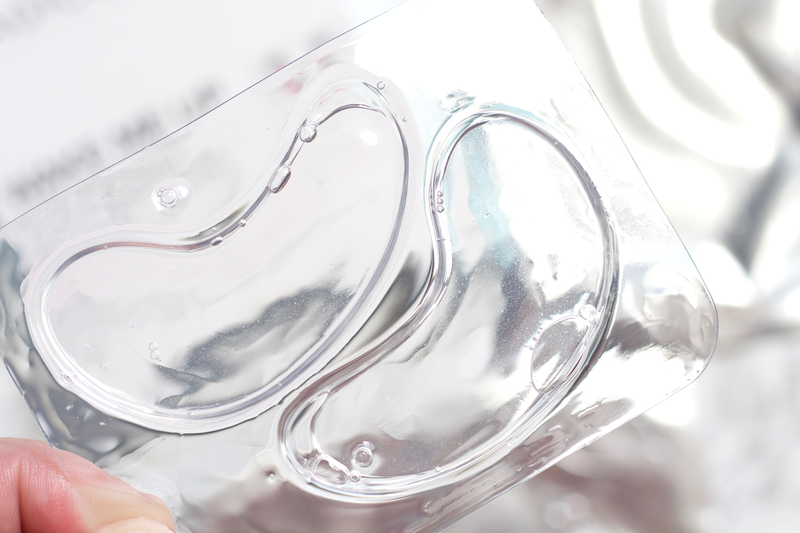 The cold sensation from the eye patches put onto the skin help lessen the swelling of the under eye area, a trick that is quite handy when needing a quick fix-up! Hyaluronic acid in the product works to provide moisture and help smooth out wrinkles, fine lines, and dryness. Hydrolyzed Collagen is also included in the ingredients, which is a major plus since you want all of the collagen you could possibly get into that thin skin area to help strengthen and boost up elasticity in the dermis. I've used sheet masks/eye packs for such a long time now, and I'm always open to trying new brands/items so this was really something I was looking forward to trying! There is SOO much yummy essence left in the container, I just love using left over essence from products and adding it on afterwards. These are honestly so easy to use too, just plop them on clean skin for 20-30 minutes and let them do their work. How many times a week you use them is up to you, but using them on a daily basis will provide much greater benefits I'm sure. I used to be a daily sheet mask'er and my skin was at the best it ever was, so even for myself I'd love to use these on a daily basis too! Your eye area will feel so nice and refreshed, and it's really essential to give this area attention since it is such a fragile and sensitive part of your face. I don't have many eye packs so I'm happy to add this to my abundant sheet mask hoarding drawer (yes, I have a problem). Ingredients: Water, Glycerin, Kassou Ekisu/褐藻エキス (Brown Algae Extract), Betaine, Butanediol, Aloe Yoju Matsu Ekisu/松樹皮エキス (Pine Bark Extract), Hydrolyzed Collagen, Rosa Rugosa Leaf Extract, Trehalose, Hyaluronic Acid, Tocopherol, Vitamin E, Carboer, Anthemis Nobilis Flower Extract, Phenoxyethanol, Ethylhexylglycerin. I sang my praises of Anne Semonin in my last MINTD post, but I've fallen even more in love with this product (if that's possible!) since being able to use it in a full size quantity. I was so happy to see this included as it was my favorite mask of all of the capsules from last month. It's a great mask for those of us oily, troubled skin types who need a product to get rid of excess oil, dead skin cells, and really help clean out our pores and smooth our skin texture. Anne Semonin is a luxury French skincare brand that focuses on using essential oils, minerals, and marine active ingredients to enhance skin's radiance and vitality, and reverse signs of aging. They use highly concentrated, active ingredients that can penetrate into the deepest layers of skin, "helping to detoxify and regenerate rapidly." They don't test on animals and are committed to using recyclable packaging. 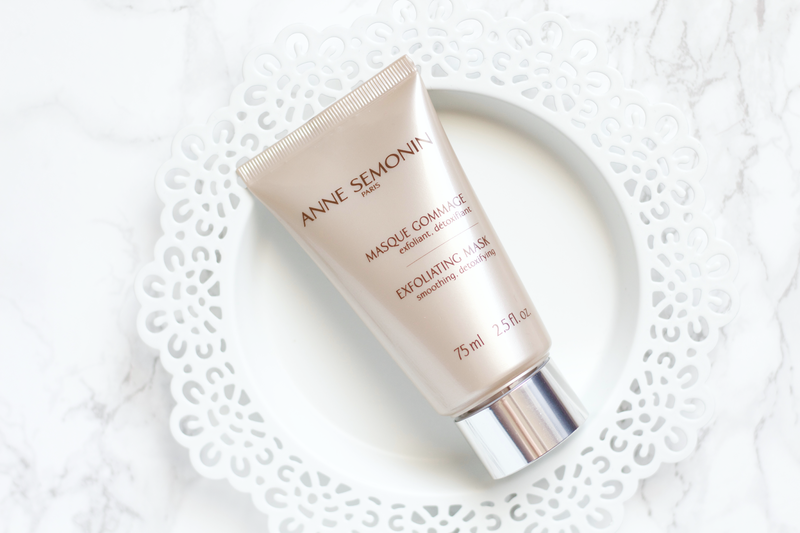 Anne Semonin Exfoliating Mask is formulated with microbeads of red seaweed, detoxifying extracts of rosemary, sage, yarrow, white nettle, and absorbent kaolin. The red seaweed beads do such a great job at really exfoliating the skin without sacrificing comfort (due to being mixed with numerous emulsifiers), as they create the most decadent experience as you work it into the skin after letting it sit for a few minutes (it is a dual purpose mask AND exfoliator). 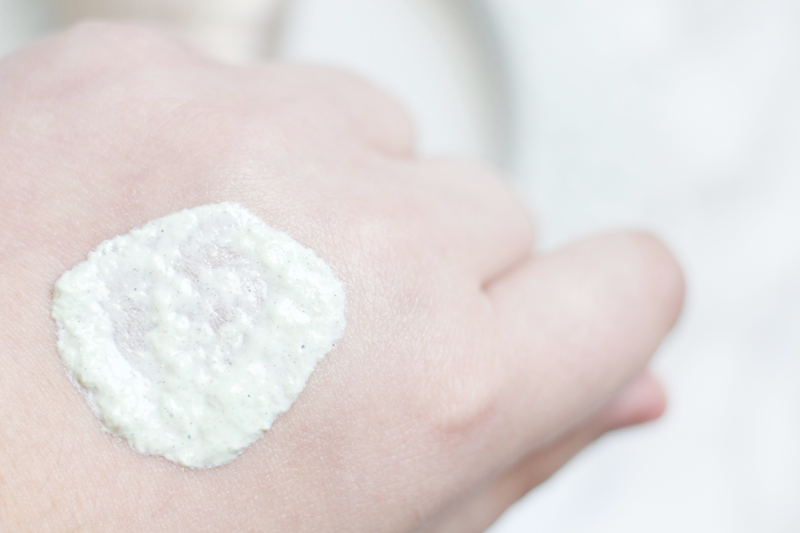 I've enjoyed using it as a mask but mostly use it as an exfoliator, that's when I've felt like I get the most out of it and my skin feels so refreshed. It makes my skin look so radiant! I've especially been happy with how its worked around my nose area, as I have issues with blackheads and I get the oiliest there. There is added fragrance to it, which is probably why it smells soooo nice. Those with sensitive skin might be careful with using this since it does contain Hexyl Cinnamal, a natural fragrance additive (smells like Jasmine) from Chamomile oil, which is a known fragrance sensitizer in high amounts (it's used in a very low concentration here, but I wanted to point this out to anybody who has sensitive skin!). 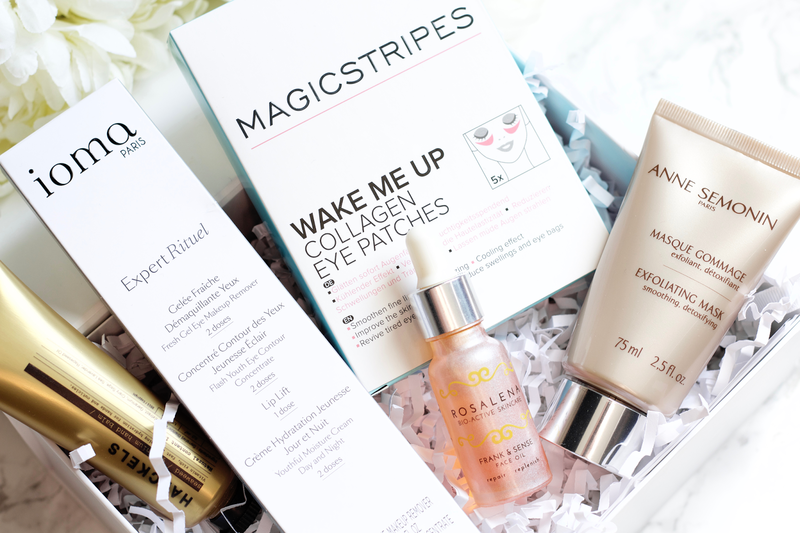 Anne Semonin has a great range of products and I personally am looking forward to trying more of, and I wouldn't have known about them if it wasn't for MINTD Box. Out of all of the products included in this box, if you had to choose to buy only one... this would be it. 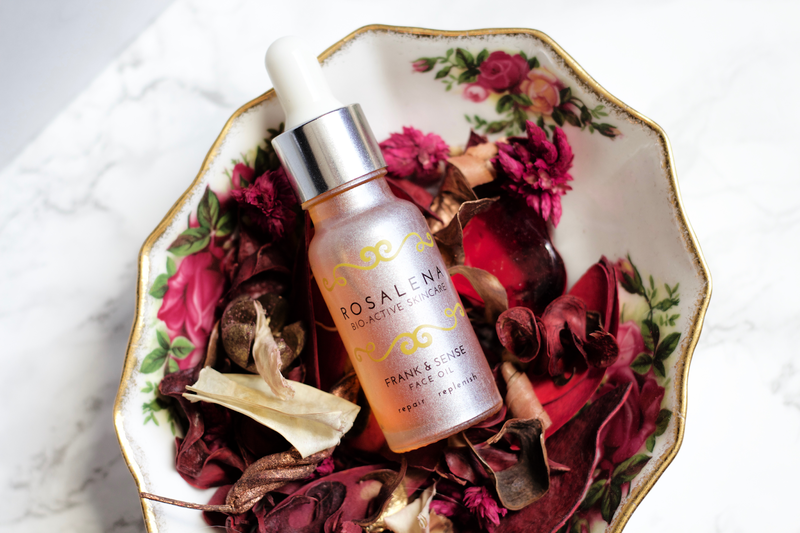 Rosalena is a UK-based natural facial oil skincare brand that uses ingredients that are wholly plant derived with no added preservatives or artificial ingredients. Maja and Helena, the two lovely and hardworking ladies behind the brand, created Rosalena because of their want for "simple and flexible" daily facial oils with nourishing plant ingredients. Their oils are packed with antioxidants, vitamins, and nutrients that are so valuable to use for skin health. Rosalena has four different face oils and one facial toner that you can try, each with their own special treatments and target ingredients: Rock & Rose (revitalize and brighten), Love & Me (nourish and protect), Beauty & The Beast (rejuvenate and energize), Frank & Sense (repair and replenish), and Goodness & Tonic (refresh and revive). Before I got this box, for a good few months I had already been using Rock & Rose facial oil after seeing Cat's lovely post reviewing it. I was apprehensive since at the time I had stopped using facial oils after a bad experience with Sunday Riley's Artemis (caused my skin a lot of reactions and smelled terrible; I'm not even going to link it, that's how much I really don't recommend it, plus I think it's also being replaced by my new favorite oil, U.F.O.). Cat had helped me get over my insecurity and worry about using facial oils again after I decided to just try this oil out. It's now become one of my all time favorite oils! I'm happily back into using face oils again and it's all because I gave this one a shot with the help of a kind and warm friend. 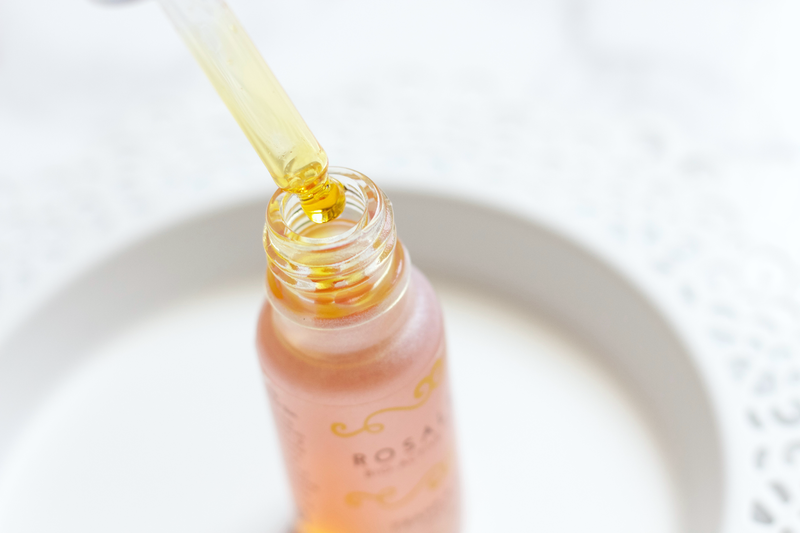 It gives me the most beautiful radiance and glow, and I'm SO in love with all of the ingredients (Rosehip Oil, CoQ10, Prickly Pear Oil, Grapeseed Oil, Safflower Oil, and Vit E, along with many others, make this a powerhouse to use). The smell is also so relaxing and I feel just so in the moment when I'm using it, which is truly fitting as Rosalena uses the mantra "Pause, Breathe, Be." Frank & Sense is another oil that I was super interested in getting initially, but never got around to buying. I was very ecstatic to see it listed as one of the products in this month's box and it was the first product I started to use when I got it. Frank & Sense is used to rehydrate, regenerate, and nourish skin by using rich anti-oxidant and bioactive ingredients that are perfect for helping us during this seasonal transition. It differs to Rock & Rose in a few ways, not only in the scent (definitely more of a herbal scent compared to Rock & Rose's floral Jasmine scent) but in how my skin responds, too. I find that this makes my face more on the oilier side compared to Rock & Rose, which I'm attributing to Buriti Oil as it's a known heavier oil that is full of antioxidants and essential fatty acids. It's a great ingredient for supporting collagen and elasticity in the skin by being a rich emollient. I've not used this on a daily basis after the first week as I'm very sensitive when using heavier products on my skin, especially at night (I restrict to using facial oils at night mostly, except for a few I will use in the mornings). I like to use this about 1-2 times a week, depending how my skin is feeling and if I need that extra rich goodness that comes with this oil! Besides the consistency, it's been a great product to really put some hydration back into my skin and get into the deepest layers. For someone who has any sun damage/was spending a lot of time in the sun, this will be a great oil to use as it has ingredients to combat free radicals, help support cell regeneration and overall health. Frankincense is an amazing ingredient because its able to help with so many things, ranging from helping heal acne scarring to being used for its aromatherapeutic benefits. Primrose, organic rosehip, neroli, and safflower oil are just some of the lush ingredients found in this product---a pure, beautiful mix of natural and green goodness. This is a great oil included in this September box as the transition from summer to winter will be having people reaching for some much needed nourishment and skin treatments. This product contains all that you'll need for that transition, with all of the antioxidants, vitamins, and lush plant oils working hard to brighten, refresh, and heal the skin. 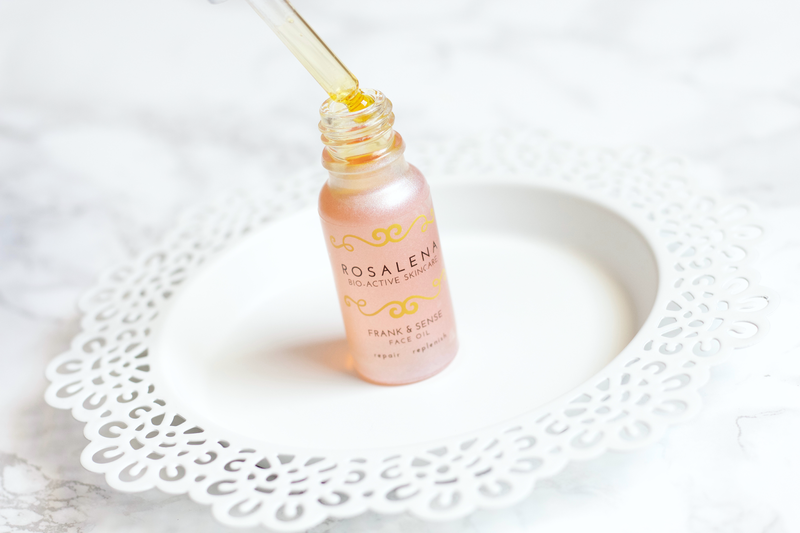 I highly recommend trying any products from Rosalena, they are a great brand with high quality products and lovely people working behind the scenes. Haeckels is a natural fragrance and skincare brand established in a little seaside town called Margate in South East England. They pride themselves on making their products with "a work of love": the love of natural ingredients, a love of design and quality, and a love of the heritage of coastal living. Their lab in Margate houses all of their hand crafted products that only use locally grown botanicals with the best antioxidant properties, holding one of only two licenses in England to harvest seaweed from the coast (which they take great pride in and respect fully by helping to maintain and monitor, "like any farmer in the world"). Margate coastline is supposedly built on a 14 mile long chalk reef (that makes up 20% of the UK's chalk reefs) and house numerous kinds not found anywhere else globally. 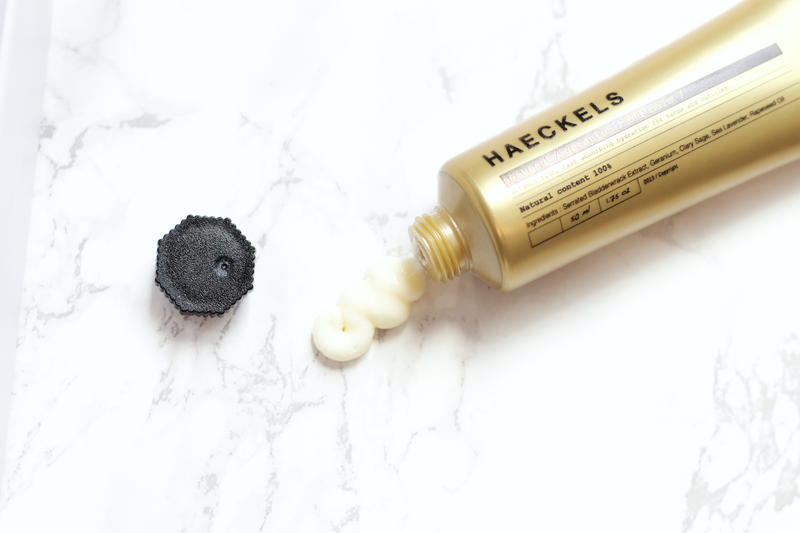 What makes this especially important and why I mention this information is because Haeckels uses this hand harvested seaweed as a base ingredient in all of their products (based on the Greek Thalassotherapy treatment), using ocean water, seaweed, ocean mud, and marine minerals to treat, replenish, and enhance skin health. They make it especially clear that they test all of their products on themselves and not on any animals, along with using them every single day to ensure the best quality and proven efficiency. I'm so impressed with this brand, even just by their information and background. I'm honestly wanting to visit Margate to see what this little town's treasures are. This is a great video talking all about the brand and their philosophy, while this one is an aesthetically pleasing one that showcases the Margate coastline and production of making their products. Seaweed & Geranium Hand Balm is a "vitamin rich, fast absorbing hydration for hands and cuticles" that contains a "blend of fragrant coastal flowers and skin-softening natural emollients" to nourish, soften, and protect your hands and cuticles. Seaweed and geranium as ingredients are important in the product's effectiveness since they "gently encourage the skin to repair and provide essential vitamins for replenishing damaged skin cells." Seaweed and marine extracts are such vital ingredients to use in skincare, as it has great anti-aging properties in regards to cellular renewal and so many more important treatments. Japanese skincare is one that has been using seaweed (wakame) in their products for a loooong time, especially in sheet masks/packs. I looove using this product, it's not greasy and it's the perfect consistency to work into the skin (perfectly between thin/heavy). It feels very light once its absorbed into the skin and my hands and cuticles instantly feel moisturized; any dry spots/cracks are eased away. It smells so lovely and has a good amount included for the price. I don't own any hand creams/balms, so this has been a product that I've had in my bag ever since I received it, and I constantly touch up with since my hands get really dry so easily. I'm quite interested in trying out other products from this brand and helping support them, as I really am inspired by their mission and usage of such great locally sourced ingredients. MINTD Box are truly the experts on how to treat post summer skin. All of these products do a great job with their selective treatments, and I've come to really find that my skin has indeed been feeling so balanced, refreshed, and nourished by each and every item used. MINTD knows how to provide a decadent experience with the products they include in their boxes and this month is no different. I'm highly impressed by their resources for finding brands and quality items for all of us to enjoy. MINTD wants to ENCOURAGE and INSPIRE women from all walks of life and help them feel confident and reveal their inner beauty through using their hand-picked luxurious products. I definitely can say I feel all of those things and more when it comes to MINTD. As I mentioned in my last post, MINTD is very helpful when it comes to choosing a subscription with them. They offer monthly/bi-monthly (£65), 3 month (£190.50), 6 month (£381), and 12 month (£762) subscription plans. All of them can easily be cancelled if you contact customer service and can be re-activated manually by you through your online account. If you're ever in doubt, customer service is there to help you with any and all questions. For those of you who have not yet subscribed, MINTD Box was nice enough to provide a non-affiliated coupon code for 10% off your first box when you sign up: 10OFF1STD + subscribe here. This box will only be available for a limited time! It will then start the process for October's box, so be sure to get your hands on this as soon as possible if you're interested. Are you subscribed to MINTD Box? What products/brands here are you most interested in trying? *All products in this post have been PR gifted. See my disclaimer for more information.